Paradise in the Maldives—But For How Long? Updated | Poking precariously above the water, Mirihi Island appears on the horizon like a beached turtle. The pilot of the tiny seaplane that is taking me to the Maldivian resort, recently voted the seventh best hotel in the world, is sitting within arm’s reach. He is not wearing any shoes. After a splash landing, a posse of islanders greets me on the pontoon. They also are barefoot. 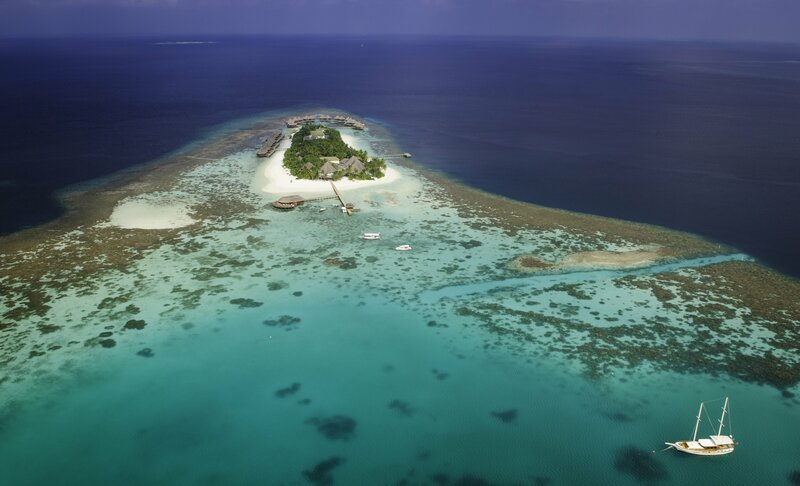 Before I have checked in, a staff member politely asks me to remove my sneakers and leave them lying in the sand to be picked up and taken, together with my bags, to my water villa, a straw-roofed hut suspended on stilts above the water 20 feet from shore. Going barefoot is part of the character that Swiss-born co-owner Amy Stierli has spent the past 15 years trying to create on the island. “Barefoot luxury” is how she describes it over a welcome drink (a coconut with a straw stuck in it). She calls Mirihi “a desert island but with a five-star service.” There is a definite Robinson Crusoe-feel to the place, albeit carefully choreographed: no bathtubs, no swimming pools, no TV sets in the rooms. Their absence means that, absurdly, Mirihi Island is classified as only a four-star resort. With 157 staffers serving the needs of just 76 guests when the resort is fully booked, Mirihi’s motto is to deliver an experience “as unique as you are.” This cliché feels especially apposite when you consider the homogeneity of the guests. They are almost exclusively couples, ranging from the semi-young to the semi-old: Younger people might not be able to afford a resort like this, while the very old might find all the sand difficult to navigate. Everything is tailored for two: two loungers on the deck, two sinks in the bathroom, two bathrobes in the cupboard. Even the bats have made this a romantic destination, piercing the evening quiet with their mating screeches. 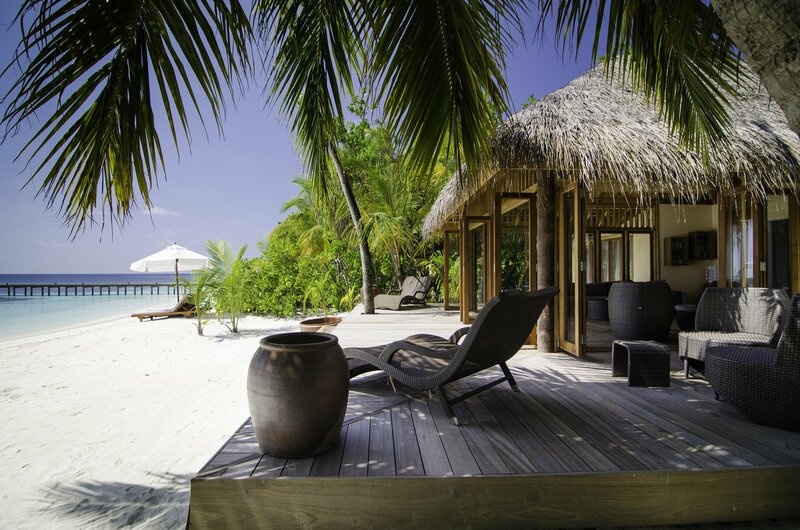 The island’s motto becomes less convincing still when you consider that it is one of more than 100 luxury resorts in the Maldives, spread throughout the roughly 1,200 similarly archetypal tropical island paradises. Yet somehow Mirihi does manage to feel unique. It has its own currency—the hotel gives shells to repeat visitors to spend on the island—and even its own time zone. Stierli has set the island’s clocks one hour ahead of the rest of the country, which allows guests returning from afternoon activities time to catch the sunset. Day excursions to neighboring islands, diving with whale sharks and dolphin spotting offer guests the opportunity to escape the island, which, at just 1,300 feet long by 165 feet wide, can begin to feel claustrophobic, especially because there are no independent shops, bars or cafés on its land mass. One restless afternoon I found myself doing laps of the island, first by foot (seven and a half minutes), then by canoe (18 minutes) and finally swimming (33 minutes, if you discount the time spent marveling at the fish and turtles wallowing around the surrounding coral reef). Mirihi looks like a cartoon of a desert island: Each picture I take seems worthy of a postcard, largely thanks to the small armies of workers who meticulously rake and comb the sand across the entire island from predawn to dusk. The manicured sand is as soft and sanitized as talcum powder. Even the sun seems preset for my comfort, the bright wide sky as clear as the water. There are also no mosquitoes to worry about, nor mice or dangerous creatures. Though I don’t see any, Stierli tells me there is the odd rat, though clever rebranding means the staffers refer to them as palm squirrels. This island paradise image, which helped Mirihi Island Resort earn the rank of seventh best hotel in the world in TripAdvisor’s 2016 Travelers’ Choice Awards, fits a broader notion that all this may well be too good to be true. It is a paradoxical paradise, one that conceals global problems that will almost certainly lead to its demise—if not within years, then in mere decades from now. If you look closely, you can already see its effects. Sand sucked up from the ocean floor by specially adapted ships tops up Mirihi’s beaches, while a wall on the island’s eastern side prevents more land from slipping into the sea. To add to these woes, estimates suggest the Maldives has the highest number of foreign fighters per capita to have joined the ranks of the Islamic State militant group (ISIS), leading some to declare that climate change is the least of the nation's worries. One attack on a resort from a returning jihadi fighter would be a disaster for tourism, which accounts for 80 percent of the country’s gross domestic product. It is a testament to Stierli’s utopian vision that one’s capacity for comprehending such profound concerns is so severely compromised while on the island. On this pristine Eden, you are Adam or Crusoe, barefoot upon unblemished sands as they slowly sink to join the turtles beneath. Anthony Cuthbertson traveled as a guest of Mirihi Island Resort. Nightly rates start from $600 per villa, B&B, based on two people sharing (excluding taxes and service charge). For more information, visit www.mirihi.com. Correction: This article originally contained a reference to the Maldives topping a list of the world’s 10 most unstable countries; the list was not based on independently verifiable statistics, so the reference has been removed.